For years, developers have known that one of the best ways to reassure users is by signing code using a digital signature accessed via a private key issued by a respected certificate authority. But signed code is not invulnerable. Due to lax key security and vetting processes, malware has managed to infiltrate applications with signed code. Extended Validation (EV) Code Signing Certificates help to halt malware infiltration by requiring a rigorous vetting process and helping ensure that private key security cannot be compromised. EV certificates require a hard token and associated PIN in order to sign code, introducing a more secure physical factor of authentication to the signing process. 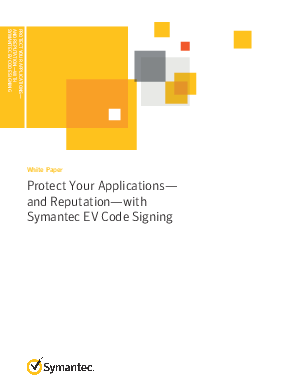 The EV Code Signing process provides browsers, operating systems, and security software an additional source of confidence in applications signed with an EV certificate.